Here are a few more amazing projects from the QQ Design Team created with the new 'Cherry Truffle' paper collection included in the August Club Q Monthly Kit Club. 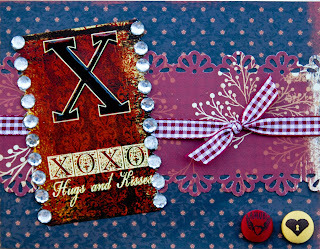 Description: This is a card that I created using the August Club Q kit and the new Quick Quotes Vintage Alphabet & Quotes Stacks in Cherry Truffle. I used a scallop border bunch to create the edge on the Alphabet Quote and added clear jewels to each scallop. I also added glossy accents to the “X” to make it stand out more. I also inked everything with Quick Quotes Midnight Confessions PowerPuff Chalking Ink. 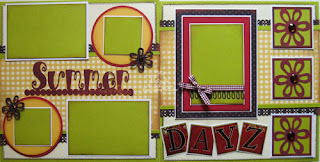 Items Used: August Club Q kit, Quick Quotes Vintage Alphabet & Quotes Stacks in Cherry Truffle, Cardstock (white, red, yellow, and green), QQ jewels, Martha Stewart border punch, QQ chalking inks in Midnight Confessions & Green Tea. PS - our first official FRIDAY challenge is coming this week! Come back & join in on the fun!!! Beautiful card Jen! Love your color combinations!Fantastic! Beautiful card and layout. I love the vivid colors. I can't wait till the Friday challenge. Got my prize box yesterday from the first challenge you did and I am so lovin everything. Thanks so much for a wonderful prize. Cute card. The bling adds a little zip. Great job Jen and Melin! Love the card Jen....beautiful as always!